What are Wisdom Teeth “Pros” of Removal and “Cons” of Watchful Waiting? The debate about wisdom teeth has always centered around one major question: Do wisdom teeth need to be removed or not? It has long been established that wisdom teeth that have associated pathology (tooth decay, gum disease, infection, pathologic cysts or tumors enveloping the root) need to be removed. However the question has always remained whether pain free, erupted (in the mouth) or impacted (not in the mouth) wisdom teeth have to be removed? Does “pain-free” wisdom tooth also mean “disease-free” wisdom tooth? Recently, the American Association of Oral and Maxillofacial Surgeons published the results of the “Third Molar Clinical Trials”. This was a major clinical study performed by “The Task Force for Third Molar”. The Task Force, which consisted of distinguished clinicians in the field of Oral and Maxillofacial Surgery from major US academic institutions, collected and interpreted clinical information relating to the management of third molar “wisdom” teeth over the period of fifteen years. 25% to 60% of patients, depending on their age or gender, had clinical evidence of inflammatory gum disease. 28% to 77% of patients with asymptomatic wisdom teeth will have tooth decay (caries). Part B: What happens to wisdom teeth if they are retained (not removed)? Retained wisdom teeth change their position over time, but not in a predictable way. They may erupt into the mouth and subsequently develop decay and inflammatory gum disease. Among patients with pain-free wisdom teeth, who have no evidence of inflammatory gum disease 30% to 40% developed inflammatory gum disease after a period of 5 years. In 40% of patients with visible wisdom teeth and gum disease and bone loss present, the bone loss is expected to also involve the other molar teeth within 2 years. Young and adolescent patients with visible wisdom teeth have a greater risk of developing inflammatory gum disease compared with their peers without visible wisdom teeth. Only 75% of impacted, pain-free wisdom teeth are free of disease. So, if a patient has 4 impacted wisdom teeth, even though they are pain free, chances are at least one of them has either: decay, inflammatory gum disease, cyst or a tumor around it. Among patients with pain-free and disease-free wisdom teeth who chose to keep their wisdom teeth, at least one third of the wisdom teeth develop disease within 4 years and need removal. Removing wisdom teeth significantly improves the gum and bone health of adjacent teeth. Removal of wisdom teeth resulted in threefold reduction in the proportion of adjacent molar teeth with gum and bone disease. Most young, healthy adults may expect to have full recovery within 5 days or less after wisdom teeth removal. Increasing age (greater than 24 years), level of impaction of the wisdom tooth, and the need to remove bone are associated with delayed patient recovery after the surgery and delayed clinical healing. Not surprisingly, delayed clinical healing also increases the risk for delayed recovery of lifestyle (daily activity, recreation, social life), oral function (talking, chewing, resuming normal diet) and prolongs bad breath and discomfort in the mouth. Pain-free Wisdom teeth does not mean disease-free wisdom teeth. Even if the wisdom teeth are not bothering you, you may still have wisdom tooth decay or inflammatory gum disease around your wisdom teeth. The older you are when you get your wisdom teeth out (after the age of 24), the more difficult the procedure, the longer the recovery, and the higher the risk for complications. If you choose to keep your wisdom teeth, make sure your dentist routinely monitors them for any evidence of pathology developing around them. What are the 3 Common Problems Caused by Wisdom Teeth? This happens because it’s nearly impossible to maintain good oral hygiene around impacted teeth. Food, plaque and bacteria get stuck between the wisdom tooth and the other erupted tooth, causing tooth decay on adjacent teeth. 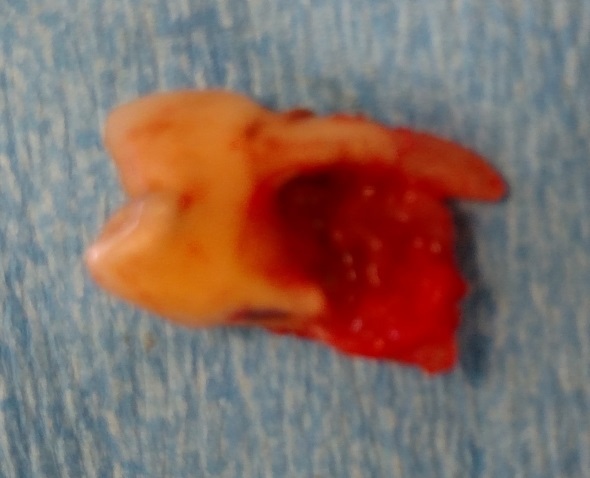 This requires additional treatment (Root canals, crowns, etc…) on a tooth that was otherwise completely fine before the nearby wisdom tooth started to push into it. 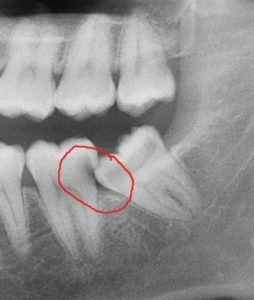 The problem could have been easily avoided had the wisdom tooth been removed early on, before it started to cause damage to the adjacent tooth. Sometimes, the wisdom teeth grow on top/over the second molar teeth. As a result, second molars fail to erupt/come out into the mouth normally. This leads to poor occlusion/bite, poor hygiene due to teeth being “crooked”, extensive orthodontic treatment (prolonged treatment with teeth braces), and of course more surgery. The problem could have been easily avoided had the wisdom teeth been removed before they started to cause problems. Sometimes, due to the fact that impacted wisdom teeth push on the other teeth, the adjacent teeth can get resorbed/damaged/eaten away, much the same way as adult teeth resorb baby teeth. 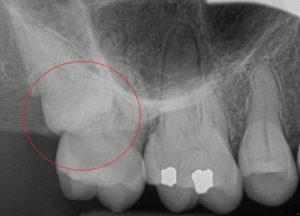 This oftentimes leads to patient loosing not only the wisdom tooth, but also the adjacent resorbed tooth, that the patient was using for chewing previously. This unfortunate problem could have again been easily avoided if the wisdom tooth was removed before it started to cause problems. What is the Damage Created by Impacted Teeth? I wanted to share a story with you…This patient came into my office for evaluation prior to removing an impacted tooth. Impacted tooth is a tooth that is “stuck” in the jaw bone and is not able to come out into the mouth. Impacted teeth most commonly are wisdom teeth, but also can be canines or “eye teeth”. In this case the impacted tooth was a canine/eye tooth. The patient knew the tooth was stuck/impacted, but did not feel that it could turn into a bigger problem. 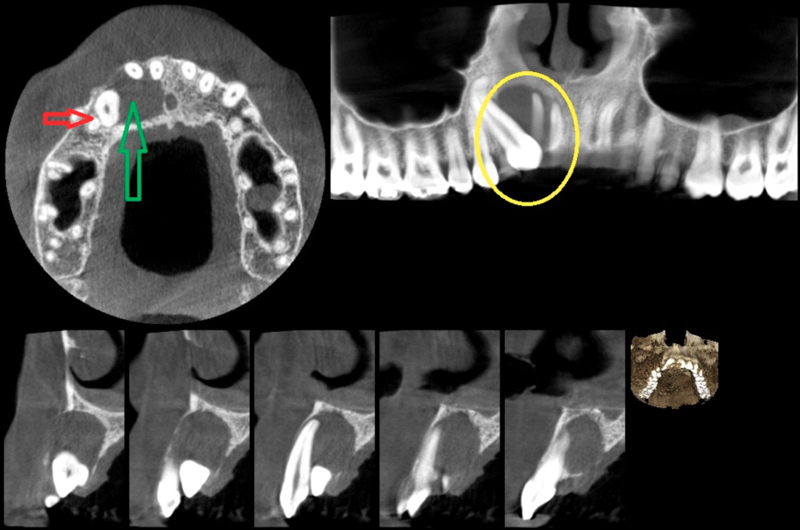 His xray revealed that the impacte tooth (small red arrow) resulted in an extremely large bone defect (large green arrow and yellow circle) that is now affecting the front tooth next to it. The reason for this is that the teeth develop in a sack of tissue called dentigerous sack. As the tooth erupts/comes out into the mouth the dentigerous sack disintegrates. But in a situation like this, when the tooth is stuck, the dentigerous sack does not disintegrate and remains inside the jaw bone. In that case, what happens is that pathological processes can take place inside the dentigerous sack, potentially turning into an aggressive cyst or a tumor. That cyst or tumor can locally destroy bone, as we can see in this case. In addition, the adjacent front tooth now has no bone support whatsoever, and will be most likely lost as well. Fixing these problems will require a lot of time and effort. If the situation was addressed earlier, perhaps the destructive process the cyst has created could have been minimized. The take home point is this: If you have an impacted tooth (Wisdom teeth or canine teeth or any other teeth)—please have them evaluated by your dentist or an oral surgeon. There may be serious trouble lurking under the surface that if left untreated can turn into a very destructive process that will be very hard to fix. 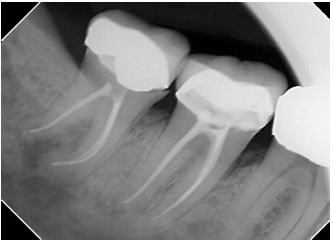 Do you need Root Canal/Crown on Wisdom Tooth? A patient came into my office, complaining of pain and swelling on the lower right side. He was having a severe toothache and had difficulty swallowing. The problem was with the lower right wisdom tooth. When an xray was taken I noticed that the tooth has had a Root Canal Treatment in the past and was also severely infected. When patient saw his dentist two days prior, the dentist recommended that the tooth be re-treated (have a Root Canal Procedure re-done). There are so many things wrong with this…First of all—NEVER NEVER do a Root Canal Treatment on a wisdom tooth. NEVER. Wisdom teeth have a very unusual, unpredictable anatomy, so doing a successful Root Canal Treatment is unpredictable at best. Needless to say, re-treating a root canal on a wisdom tooth should never have been offered to a patient either—Why would you do a wrong treatment on a tooth TWICE? This was a potentially life-threatening situation—infection was already pretty severe and delaying the needed treatment (extraction of the tooth) would have potentially put the patient’s life in danger. Had the infection spread into the deeper tissues of the neck, the patient would have ended up in the hospital with a severe, life-threatening infection. Luckily the patient made the correct decision to have the tooth removed. He is well on his way to recovery. The take home point is: the only treatment that needs to be done on a wisdom tooth is an extraction—you should not waste your money on fillings/crowns/root canals for a wisdom tooth. The treatment is likely to fail in the long run, and you will need the tooth removed anyway. So why take the chance? The risk that you face with an infected wisdom tooth is too large to take. Do I need a bone graft after Wisdom Teeth Extractions? The answer is absolutely and unequivocally NO. Bone grafting is not needed at all after Wisdom tooth extraction. There is one small exception to this rule, but other than that, bone grafting is not needed after a wisdom tooth extraction and can actually create more harm than good. Let us look at this closely. For a typical teenager or young adult getting the wisdom teeth out, the bone is expected to heal well on its own. Our bodies have an amazing healing potential and the jaw bones will heal well, providing appropriate support for the other teeth without any additional bone grafting. In fact, doing a bone graft in this case is absolutely contraindicated as introduction of a “foreign body” that bone graft material is, will likely delay appropriate healing and increase the chance of infection. The only exception to this rule is when the patient is older, with a diminished jaw bone healing capacity AND compromised bone support for the tooth adjacent to the wisdom tooth being removed. In this case, a bone graft can be contemplated and should be discussed with the patient, but the decision to proceed should be done on a “case by case” basis only, and that is only after a patient has been properly counseled on all risks/alternatives/potential benefits of treatment. The sad reality, however, is that a lot of patients are getting “conned” and “talked into” bone grafting procedures for wisdom teeth, even when there is no need to do so, especially for teenagers or young adults. These cases tend to be the ones where the dentist feels that the insurance reimbursement for the wisdom tooth extraction is too low, and the patient revenue can be increased by introducing another, higher paying procedure. Insurance typically doesn’t pay for this bone grafting procedure, so it ends up coming out of the patient’s own pocket. This is sad, but also, unfortunately true. So next time you are being advised to do the bone graft during a wisdom teeth extraction, please think twice before committing to the treatment. You mouth and your wallet will be happy you did.